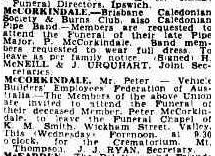 This entry was posted in BEYOND THE INTERNET, Family History and tagged Beyond the Internet, funeral directors, Peter McCorkindale by cassmob. Bookmark the permalink. Thanks Fi. I think we’re all a little partial to scattergunning…have done a bit myself today. This was a new set of records that had never occurred to me. I suppose the first challenge is finding what funeral director the family used. An intriguing idea to follow up. 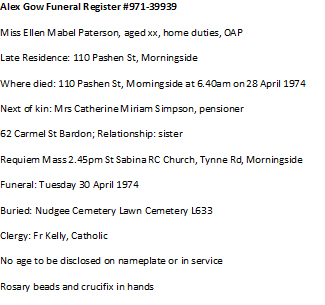 Worth a go Susan…it usually says which funeral directors on the funeral/death notice -at least over here. Don’t know about UK unfortunately (still haven’t tracked down where my great-grandfather was buried in Glasgow).